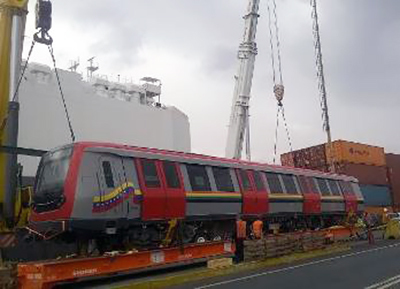 Alstom’s trainset for Los Teques, Venezuela. Photo: courtesy of Alstom. Alstom has delivered the last of 22 metropolis trainsets that will run on Line 2 of the Los Teques’ metro system. Alstom supplied 22 metro trains, each of which consisted of 6 cars, medium voltage electrification, traction substations and part of the signaling equipment. “Grupo de Empresas”, the Alstom-led consortium with Colas Rail and Thales, was subcontracted by Consorcio Linea 2, and was responsible for the project, including engineering, integration and commissioning of the electromechanical works on a turnkey basis. The new trains feature wide access doors, increased passenger capacity with corridors for circulating between the cars, internal LED lighting and a CCTV surveillance system. The trains were manufactured at the Alstom site at Valenciennes, France.